Operation: Zip the Wedding Dress. I got my wedding dress in the mail last week! It’s beautiful. I wish I could share it on this blog, but it’s a secret until the big day. However, there is a slight problem. It fits perfectly everywhere, except right around my rib cage, it won’t zip! I really don’t want to return it for the bigger size, considering that might require a lot of alterations because the rest of the dress fits so well. Also, if I’m being honest with myself, I’ve gained a few pounds that I can stand to lose anyway. So, Operation Zip the Wedding Dress starts today. It felt weird to just go to the gym, knock out that workout (in 30 minutes) and then leave. I don’t know if I’ve ever done that! But, I definitely feel it. My arms are still jello! I hate logging my food, but there is no doubt that it works. I actually solidly logged my food for probably 2-3 years, and about a year ago I just got so sick of it and stopped. 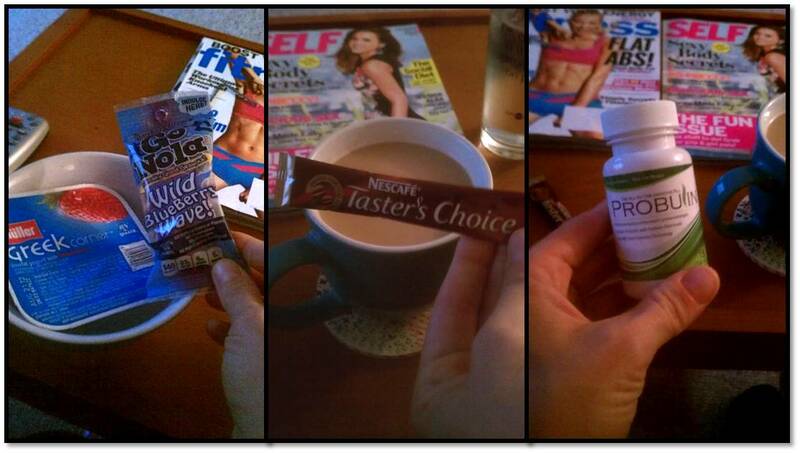 The Jamie Eason Trainer has an eating plan as well, but I’m not sure I will follow it exactly. I know I need to eat clean to see results, so my main goals are to eat clean at every meal, eat about 6 times a day, drink plenty of water, and log all my food, even if I slip up. One thing Jamie says to do is to eat your first meal within an hour of waking up. Usually, I just have coffee before the gym and then eat breakfast once I get to work. That means I’m not eating until about 3 hours after I wake up! Probably not good. 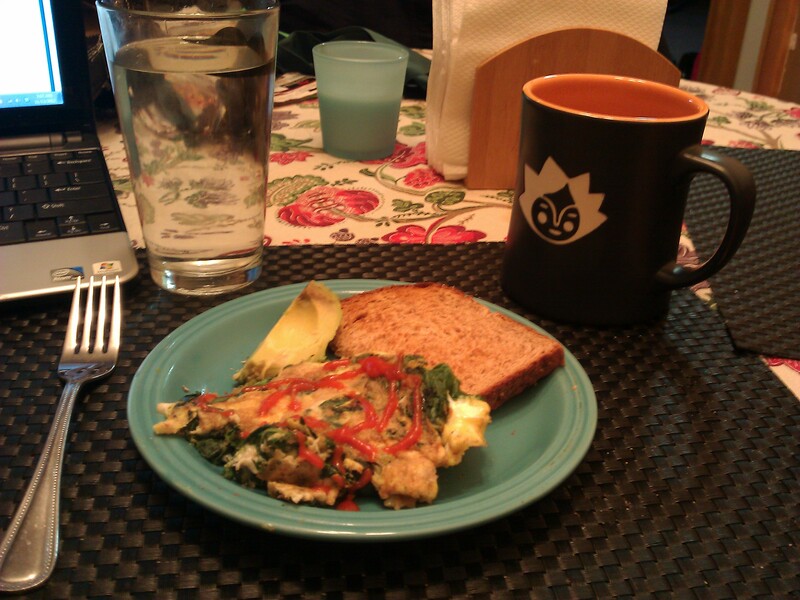 So this morning, I made some sauteed kale with 3 eggs, toasted a piece of whole wheat bread and cut half an avocado. I put half of the breakfast on a plate and the other half in a Tupperware container to take to work. I ate this right after getting back from the gym, just about 1 hour after I had woken up. I mashed the avocado onto the toast. It was delicious. 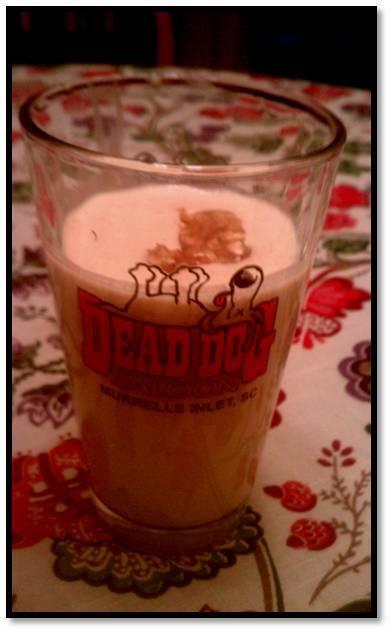 I also had a cup of coffee with almond milk and stevia. Yum. Then, I had the other half of that breakfast when I got to work. I’m nice and satisfied, and will hopefully stay that way until lunch. …and that’s it! Yep, just exercise regularly and eat right. That’s all it takes to lose weight! Weight loss can be a touchy subject, so I just want to be clear that I’m not just losing weight to fit into my dress, although it is the motivating factor at this moment. Since I got back from vacation at the end of August, I’ve been feeling like I’ve been off track. Not only have I seen some higher numbers on the scale (not always the most accurate tell of weight gain, by the way), I’ve also noticed that some of my clothes are a little more snug than they usually are, and I’m getting that icky feeling when I see certain photos of myself (my finish line photos from the half were NOT flattering — and not just because I was clearly in intense pain). 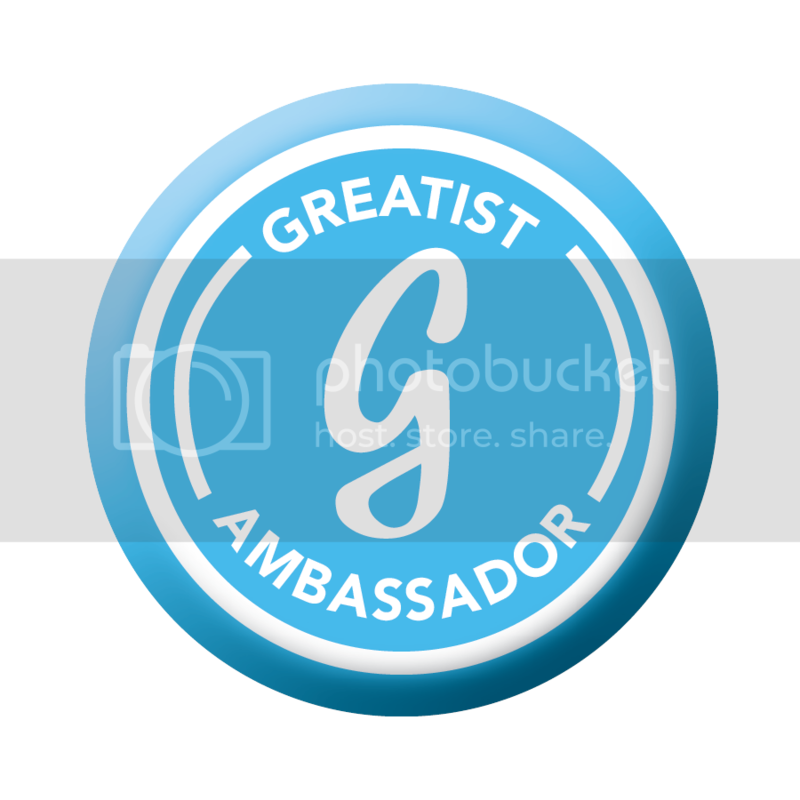 I am not an advocate of constantly trying to fit a certain ideal, but I am an advocate of feeling good about yourself. When I don’t feel great about myself, it’s important to me to adjust accordingly. How do you adjust accordingly when you aren’t feeling happy with your body? Fit Sugar’s Beginner, Intermediate and Advanced intervals + a hills workout. 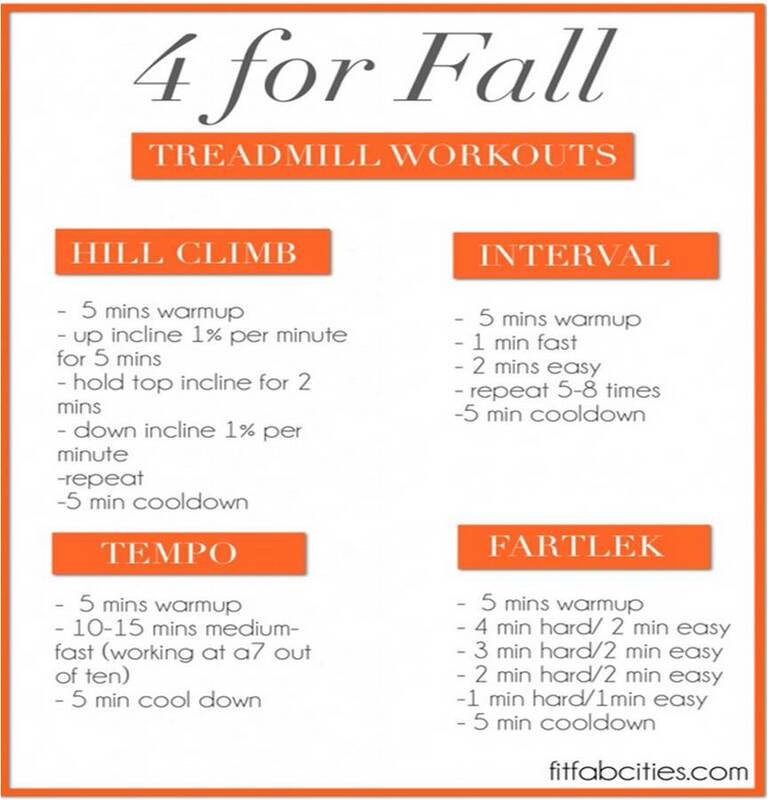 These “Four for Fall” workouts from Fit Fab Cities. I ended up doing the Fartlek workout from the 4-for-Fall after work last night and it was a killer. I was definitely pouring sweat and huffing and puffing. I ran a fast 2.5 miles and it took just under 20 minutes. That was perfect for after work. I packed my gym clothes with me to work, walked to the gym, pounded out a workout and was home by 6:00 PM. Perfect. This morning, I did that Pyramid Interval workout. It felt easy at first, but I was definitely feeling it by the end. I had a relapse of my bad stretching habits. Remember when I told you that you should always stretch after a workout so you don’t end up with sciatica issues like me!? Well, I didn’t heed my own advice and I’m feeling it this morning. After my run this morning, I hobbled home and spent at least 10 minutes stretching it out. I feel a lot better, so I just need to keep reminding myself that if I don’t stretch, I will be in pain. I had one of the best lunches ever this week. Leftover chili is the best, no? 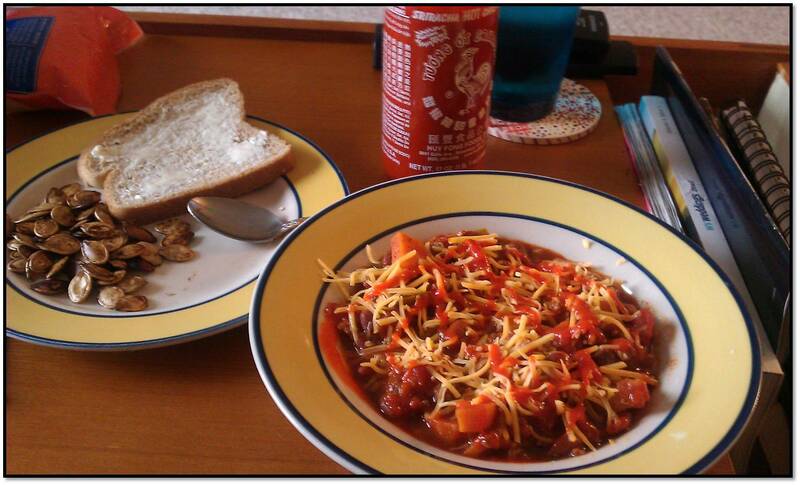 Also, to me there is nothing better than a slice of buttered bread with chili. Also, if you are planning on roasting some pumpkin seeds soon, I highly suggest Mama Pea’s Salt & Vinegar style roasted seeds. Last year, I tried a variety of spice mixtures on my seeds. This year, I didn’t mess with anything other than the winner, they are SO GOOD. 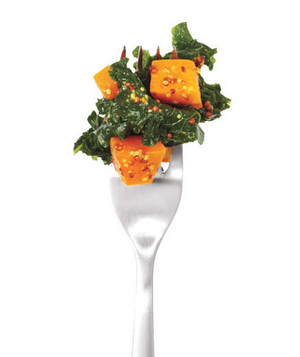 Mustardy Kale and Butternut Squash from Real Simple. And, finally, Do you think I can get through my half-marathon? As of now, the half-marathon is just under 12 days away. I’m a little nervous that I can get through the 13.265 (I thought half-marathons were 13.1, but ours is 13.265. I’m so annoyed about it, too) mile run, as the last time I’ve run that distance was….well, two years ago when I ran this race! Since my post-vacation training hasn’t gone as planned, the furthest long run I have done is 9 miles, and though I’m a better and faster runner than I was 2 years ago, I’m also having some pain. I’m just really nervous! Do you get nervous before a big race? Like, the best night’s sleep I’ve had in a very long time. I did not wake up during the night one time. I did wake up at 5:45 AM long enough to decide that I’m going to be keeping Monday as a rest day, and then rolled right back over and went to sleep until Zach’s alarm went off at 7. Ahh, sweet relief! I’m in a great mood today, because we have officially entered the period of time which it is appropriate to count down to vacation! Although, in the interest of full disclosure, I’ve really been counting down since August began. I really can’t wait, and I have a few vacation related blog post ideas formulating in my mind. 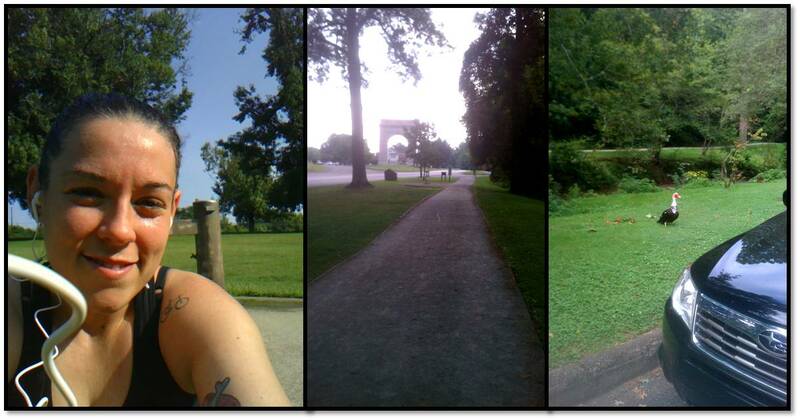 From left – right: Me taking a break near my favorite water fountain, my favorite view, and my nemesis/lucky charm, the Muscovy duck that lives in the park where I run. I would have gotten closer to him to take a photo, but I harbor a healthy fear of him, so that’s all you get. I also had some instant coffee (still no coffee pot), which is surprisingly not bad. I followed it all up with a glass of water and a probiotic (I’m going to do a probiotic post soon, because I’m loving them!) and caught up with some magazines while my food digested. I had a great run, as I mentioned. My training plan called for 6 miles, but I had to pause my CardioTrainer app (which was tracking my miles) at one point because some guy and I were running a ridiculously similar pace. It was awkward, so I stopped and pulled over to let him go ahead a bit. Apparently I forgot to restart the app, because I didn’t notice it until much later. I estimated I had ran about a mile or so, so I just added an extra loop on at the end of my run just in case I was shorting myself. Well, when I got home, I logged on to Map My Run and I had done 6.81 miles! To be honest, I could have kept running too, so that felt great. I had planned to make brunch for me and Zach when I got back, but he decided to go golfing with his dad, so I whipped up some lunch for myself. I was surprised that I wasn’t famished right after my run like I usually am, I guess the yogurt/granola combo is a winner for staying power. I’ll have to remember that come half-marathon race day. I bought some local tofu at the Wild Ramp market which I really wanted to try. I’ll tell you this: I’m never buying any other tofu again. This tofu had the best consistency, I only had to press it for 5 minutes, and I was able to cook it without the tofu breaking up and turning into a scramble. Even when I buy extra-firm at the grocery store, it doesn’t have the firm texture I’d like. I made the Cast Iron Tofu using Caitlin’s method (Healthy Tipping Point is hands down one of my favorite blogs! 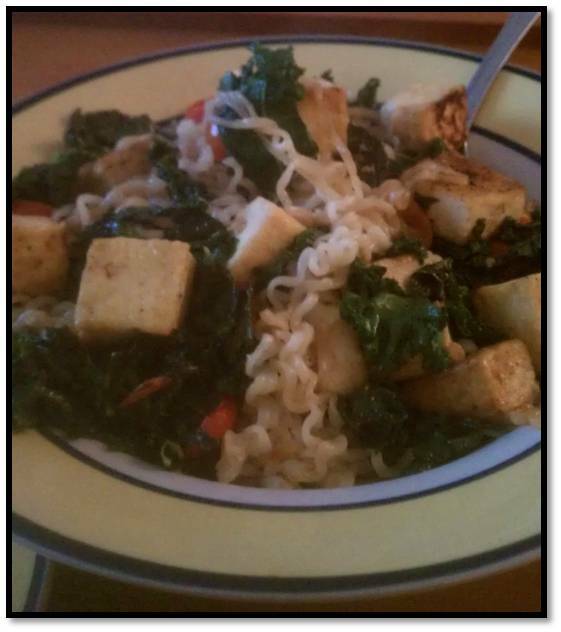 ), added it to some sauteed Kale and served it over Ramen noodles. Yes, Ramen noodles! I’ll admit I love ’em. I don’t know if I’ll ever cook tofu another way again. It was so crispy on the outside! I love the texture of tofu, so I left the cubes to be kind of on the large side, but if you made them smaller this would be even crispier. I had a few strawberries on the side also. All of the meals I had yesterday had amazing staying power, and this was no exception. I was full for a long time after I chowed this down. I went to a 5:30 yoga for runner’s class (which was incredible!) Our instructor focused on the Piriformis, which is a muscle in your glute area. It’s a deep muscle that is hard to stretch, but we sure did stretch it. In fact, I didn’t even know that mine was tight until we started stretching it out. My legs feel great today! I’m on a budget, so I don’t know if I can afford to shell out the $8 a week to go to this class, but I think I’ll try to make it at least a monthly thing. 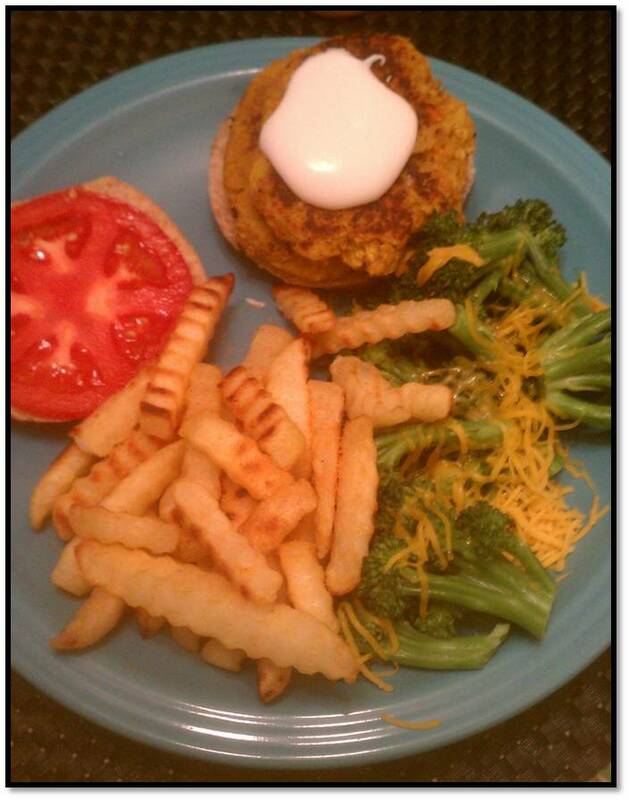 This was an amazing veggie burger! I basically just used the recipe at the end of that post for the Indian Patties, but I didn’t have chickpeas so I used Great Northern instead. Also, I subbed carrots and yellow squash as my veggies. Yum! I made it a double decker because I was quite hungry. Add some baked french fries (yay, health!) and some steamed broccoli w/ a bit of shredded cheddar and it was a yummy meal. I decided to put a dollop of plain yogurt on my burger, and it was a very good decision. 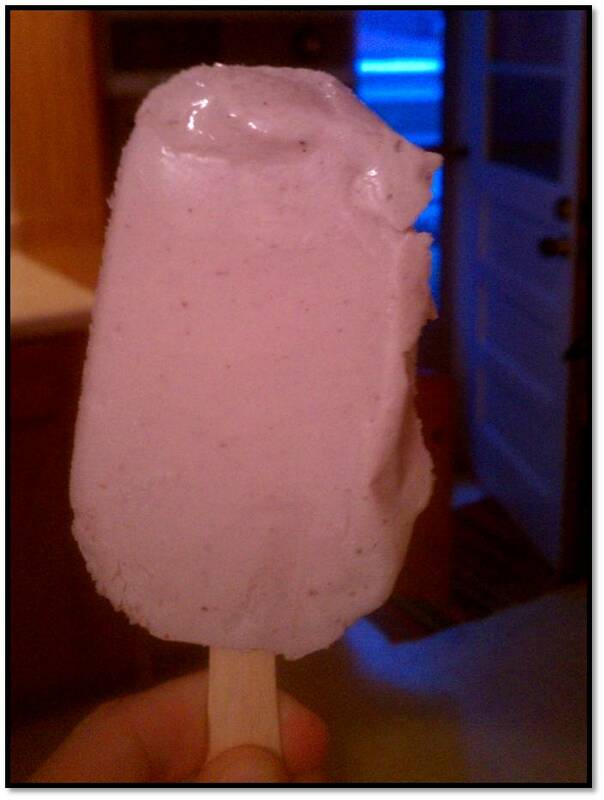 After dinner, I was ready for some dessert, so I had a frozen greek yogurt bar (flavor: blueberry), and it was delicious. It was a great day for food at my house, and I didn’t realize how much yogurt I ate yesterday until I typed it all up. I swear, that isn’t typical! What is the best thing you’ve eaten recently? Good morning! Did you see Missy Franklin win the gold in the 100 backstroke yesterday!? Wow! As I said yesterday, the AC wasn’t working and it was miserable, but I refused to let it get me down. I think I was rewarded for my positive attitude, because we ended up closing at noon and I got a half day off! It was much appreciated, as I got a lot done. The AC still isn’t fully functioning, but I’m going to keep up with the positive attitude and hopefully good things will come to me. Let’s talk about saving money at the grocery store. Other than living expenses, most people spend the largest chunk of their income on food (or at least I do!) So it stands to reason that you want to try to save as much money as possible. Healthy living on a budget, however, can be tricky. If you watch ‘Extreme Couponing’, you know that most of the people on that show aren’t buying produce and whole grains. Which is why I’m going to make kind of a bold statement: Coupons don’t work. I hope you are still with me. I know it’s an unpopular sentiment, but I’ve been working toward saving money on my grocery bill and I’ve tried clipping coupons for some time. I’ll tell you that, at least the way I shop, most coupons are completely worthless. Now, this isn’t a hard and fast rule — I’ll get to the exceptions in a few minutes — but generally, this is how it goes: Recently, I had a coupon for $1 off 2 Ortega products. We have tacos at least once a week at my house so I found this coupon to be quite a good find. I brought it to the store every single time, but I realized I never used it. Why? Because buying the store-brand version of salsa and whole wheat tortillas was cheaper than buying the equivalent of the Ortega products and using the coupon. Here’s the thing: Coupons are a marketing technique, not a money-saving tool. Ortega is counting on me not realizing that buying a cheaper brand is more cost-efficient than using their coupon. Editors note: I actually just had a Twitter conversation with a friend about this, and I think as far as couponing goes, it matters where you live. None of my local grocery stores double coupons, and store brands are relatively cheap, so take my coupon disdain with a grain of salt. Now, exceptions. I’m not sure if all grocery stores do this, but my grocery store chain (Kroger) has a loyalty card program (as most everywhere does now), and occasionally they will send me coupons on the items that I most often purchase. These coupons are invaluable. Usually I’ll get a coupon for a free pint of cherry tomatoes, or a free frozen vegetable as well, so that’s always exciting. Ok, this is isn’t the most surprising thing I’ll say, I’m sure. Usually, even if I have a coupon, it’s cheaper for me to buy the “Kroger” brand items. However, sometimes, you feel very strongly about a particular brand, but if you save money where you can, you don’t have to worry about spending a little more on the name-brand items. I love Frank’s Red Hot, but I’m obsessed with Sriracha, so I settle for the $1.49 Kroger brand hot sauce and splurge on Sriracha. It evens out. 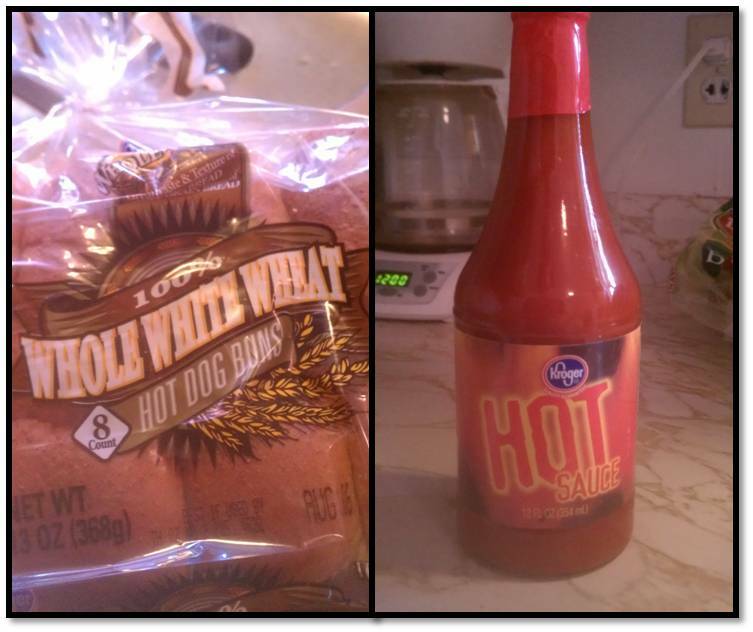 Confession: These hot dog buns totally have high-fructose corn syrup, but we don’t eat hot dogs all that often. Oh well. Yesterday, I was at the store and I knew we were out of ketchup. Zach loves ketchup, and won’t let me buy the store brand — it’s Heinz or nothing. I noticed that the 40 oz. ketchup was $2.18, and the double pack of 50 oz ketchup was $6.98. So, basically, I’m paying $0.05/oz for the smaller size, and $0.07/oz for the larger size. Right, it’s only 2 cents, but think about it. 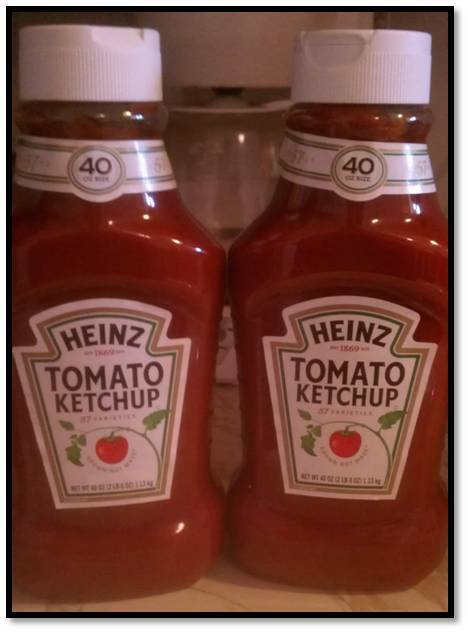 For that particular trip, I saved $2.62 by buying 2 40 oz bottles of ketchup instead of that double “value” pack. 10 oz of ketchup just isn’t worth the immediate extra expense. Sometimes, it’s ok to save your money now, rather than ‘stocking up’. As with anything, there are exceptions to the rule, but a good idea is to bring a calculator with you to the grocery store. If you calculate the cost per unit of things, you can usually figure out if you’re getting a good deal or not. I just use my cell phone’s calculator. Really, how much ketchup do you need? 3. Pre-packaged greens are not worth it. Unless you just really enjoy throwing money away, try to avoid buying pre-bagged, pre-washed produce. Especially Kale! I can’t imagine why anyone would buy pre-chopped Kale — it’s the easiest thing to wash and chop in the world, and a huge bunch that will last me a week is less than a dollar. The pre-bagged stuff is almost $4! Absurd. Exception: Manager’s Special. 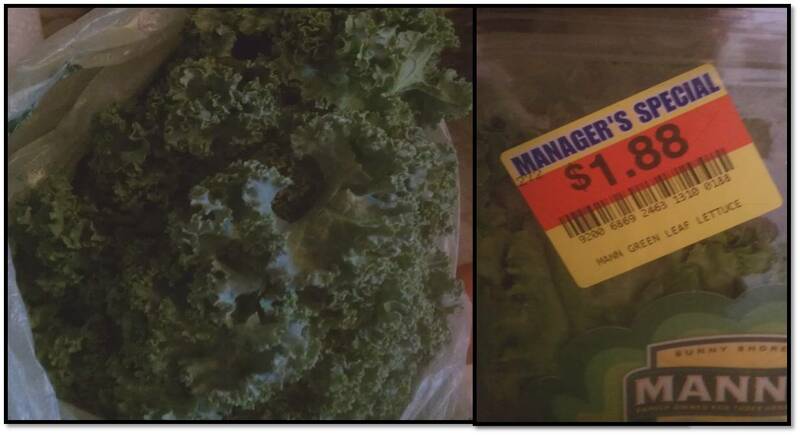 Sometimes, at my local grocery store, produce will get marked down significantly when it is close to expiring. As someone who eats their weight in produce weekly, it’s no problem for me to consume this reduced produce before it goes bad. I know. This is not what you wanted to hear. Trust me, I fought it for quite some time. But, I realized that shopping at more than one store really increases my savings (increasing savings sounds awkward, no?). Usually I’ll go to the local discount store for produce, dairy and spices and then head to Kroger for the rest of my shopping trip. It’s important for me to go to the discount store first, because the produce, dairy and spices are cheaper, but also because they don’t always have everything I need. The discount store I go to is Aldi, and they really have great deals on produce. Between Aldi, discount produce at Kroger and the Farmer’s Market, I can keep my produce costs pretty low. 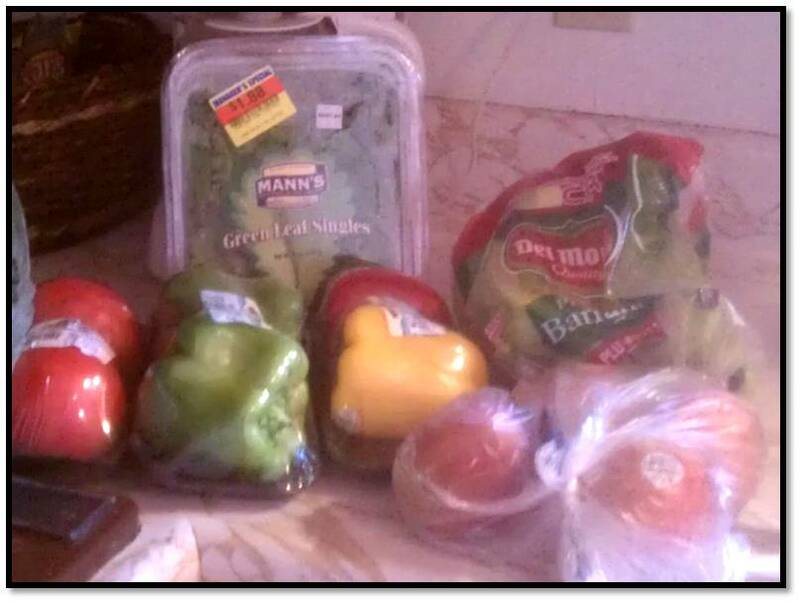 I got apples, bananas, peppers, tomatoes, a few spices, cottage cheese, string cheese and a few other items at Aldi for $15. Maybe I saved the best for last, but this is the single most important thing you can do, besides always eating before you go to the store. Plan your meals out for the week, make a list and stick with it. Also, try not to run back to the store. If you are missing an ingredient, unless it’s crucial (if you plan, you won’t be missing crucial ingredients), make do with what you have. If you follow these five simple rules, you will see a vast improvement in your grocery bill. What are your best money-saving tricks for the grocery store? …which means actually what I ate on Tuesday, because I’m writing this in the morning. But I actually had a really good day yesterday of food, so I’m excited to share it with you! But first, I want to talk about my workout this morning. I swear, my new Brooks Pure Flow shoes make me faster. When I went out for my run on Tuesday, the Nike+ app told me twice that I ran my fastest 1k. Then, this morning, I did a fast treadmill mile before Cardio Sculpt class to finish up Kristen at Following Fit’s 7-day Feats of Strength (I did it! 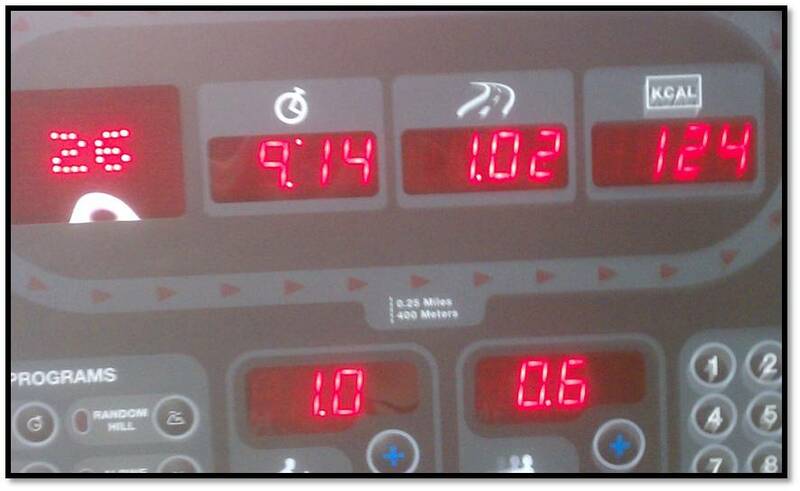 ), and it ended up being a very speedy mile (for me)! I’m pretty slow, 9:14 is like 5k race pace for me (my fastest is 27:32 or something). You’ve seen this, but it’s worth seeing again. Yum! I can’t resist taking a bite before I snap a photo. 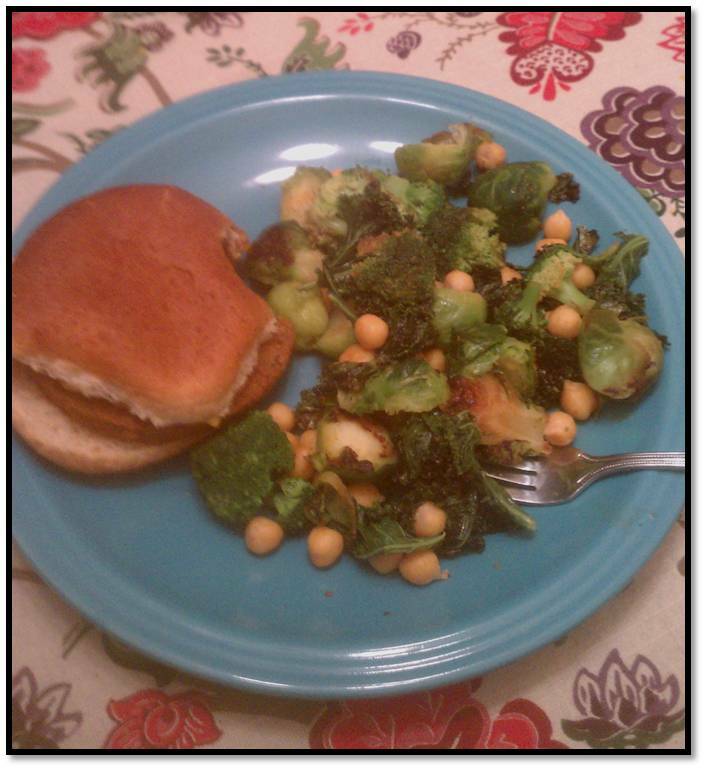 A Light Life black bean veggie burger w/ a slice of cheese and this really delicious bourbon mustard my friend Mandee bought for me when I watched her dog, and sauteed kale, brussels sprouts, broccoli & cauliflower and chickpeas. The sauteed veggies and chickpeas are a lunch staple for me. I almost always make that for lunch. Sometimes I’ll serve it with noodles, and sometimes it’s a side dish, but I probably eat it at least 3-4 times a week for lunch. I had a banana for an afternoon snack, but you know what a banana looks like, right? I know that rice and spaghetti sounds weird together, but it so wasn’t. Since I only made about a serving of each (split two ways), we didn’t end up having too much grain on our plate. 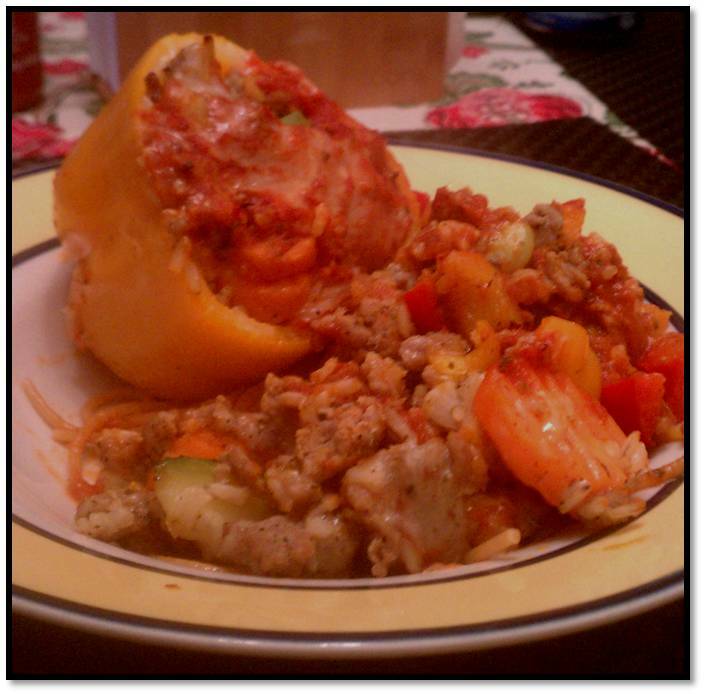 After I took that photo, I chopped up the pepper and mixed everything together. This was delicious! I love to experiment in the kitchen. Sometimes it works out, sometimes it doesn’t. This definitely did work out. 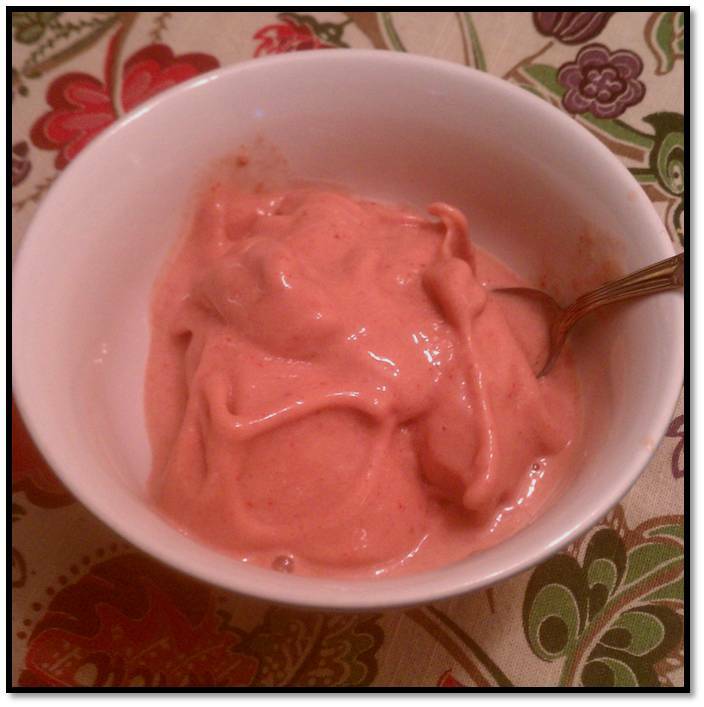 Put the banana and strawberries into a food processor or blender and blend until mostly pureed. Add protein powder if you wish and turn the processor on while streaming almond milk in until it reaches the proper consistency. Easy peasy! I usually add the protein powder if I’m eating it after an evening workout, but leave it out if not. It’s really good, and has the same consistency as ice cream. It does melt a little faster, but you could stick it in the freezer after making it to firm it up if you wish. Do you ever experiment in the kitchen?